This course will undertake a study of brahmavihāra meditation and the gradual entry into emptiness (described in the Cūḷasuññata-sutta, MN 121), relating both of these modes of practice to progress to awakening. A central focus during the study sessions will be the bodhipakkhiya dhammas, those qualities and practices that according to early Buddhism are central for liberation. This course is meant for experienced practitioners of meditation who wish to deepen their understanding and practice. The emphasis throughout the course will be on what is of practical relevance to actual meditation practice. The course will combine study and discussion sessions in the mornings with guided meditation instructions given during the silent practice periods of the rest of the day. Ann Dillon will be assisting throughout the course. To explore how the awakening factors can be related to the meditative cultivation of the brahmaviharas and of emptiness meditation. Prerequisite–Participants need to be familiar with Bhikkhu Analayo’s approach to the Satipatthana–particularly the hindrances and the awakening factors–by having sat a previous retreat with him on this topic. Please list on your lottery application. 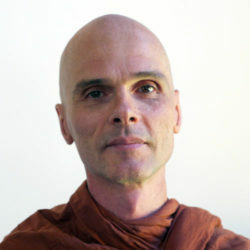 In case participants have been unable to attend one of his previous retreats, it would in principle be possible to acquire the required foundations by relying on his recently published Satipatthana Meditation Practice Guide (2018), if this is used in conjunction with the audio files that offer his guided instructions. Please provide details on how much time you have been able to invest in this form of preparation in case you wish to apply without having sat a previous course.